Any cracks or repairs of other sorts? Does it come with a case? Is shipping to the US 120 Euros? 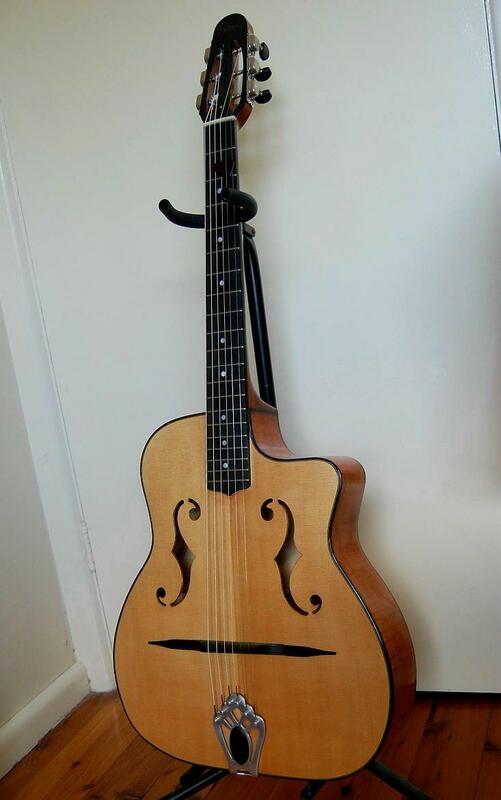 What is the bracing like on those F-hole style guitars? That one for sale looks very nice; one of Joseph juniors late ones (he retired in '92 I believe). I would be tempted but I already have something similar. Mine was made by Tony Petrarca a few years ago to my specs. He had made others before based on that design but I don't know if he had access to an original Di Mauro to copy. Tony sent me photos of the work in progress when he was building it and I have attached one showing the top braces. I had never really examined inside until I saw Bones' question so I got out my inspection camera and went for a tour of its insides. 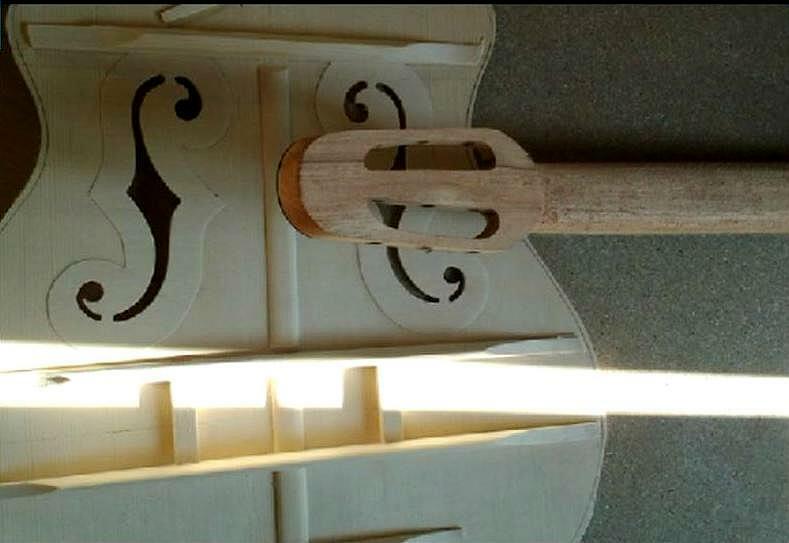 The top has one brace just above the top of the F-holes level with the end of the fingerboard, two near the bridge, about 15mm either side of the bridge and another down under the tailpiece. The back has three evenly spaced braces. I have sketched a rough guide on the attached photo, the top ones in red, the back ones are blue. Having problems uploading photos; trying again. Cool thanks Chris. I'm planning to do an F-hole short scale and an oval hole short scale to compare with my recently built D-hole short scale. Mine has a 660mm scale, but I guess 650 or 640 would not make much difference structurally. Keep us posted on progress. 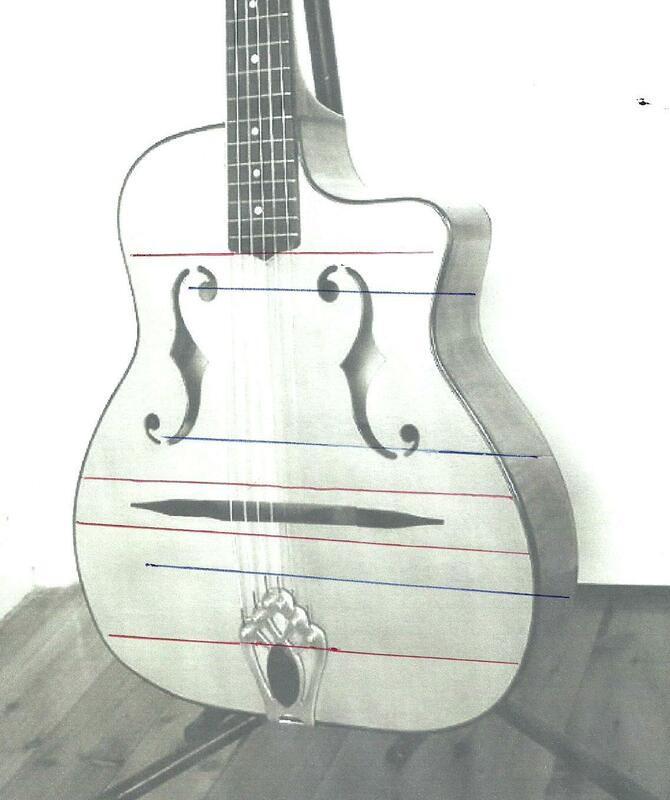 are the two short longitudinal braces under the feet of the bridge usually fitted in GJ guitars? Common to original Selmers and Favinos, although I can't be sure for all later copies.